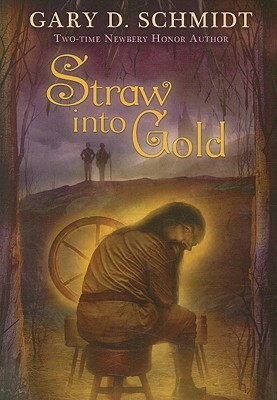 TheReadingWarehouse.com:Straw into Gold:Schmidt, Gary D.
Annotation: What fills a hand fuller than a skein of gold? By order of the king, two boys, Tousle and Innes, must find the answer to this puzzling riddle within seven days or be killed. A former nursemaid to the queen's child tells the boys that the banished queen may have the answer they seek. Danger presents itself at every turn, for the boys are pursued by the Great Barons, who are secretly plotting against the king. Another pursuer, the greedy King's Grip, reveals a strange story of a little man who once spun straw into gold of incredible beauty for the queen but then disappeared with her firstborn son. Tousle realizes that the man he calls Da is the strange little man and, even more amazing, that he himself may be the lost prince. Or could it be Innes, who although cruelly blinded can hear the music of the dawn? This skillful blend of fantasy and adventure reveals what might have happened before the queen makes her third and last guess and the story of Rumpelstiltskin--as we know it--ends. What fills a hand fuller than a skein of gold? By order of the king, two boys, Tousle and Innes, must find the answer to this puzzling riddle within seven days or be killed. A former nursemaid to the queen's child tells the boys that the banished queen may have the answer they seek. Danger presents itself at every turn, for the boys are pursued by the Great Barons, who are secretly plotting against the king. Another pursuer, the greedy King's Grip, reveals a strange story of a little man who once spun straw into gold of incredible beauty for the queen but then disappeared with her firstborn son. Tousle realizes that the man he calls Da is the strange little man and, even more amazing, that he himself may be the lost prince. Or could it be Innes, who although cruelly blinded can hear the music of the dawn? This skillful blend of fantasy and adventure reveals what might have happened before the queen makes her third and last guess and the story of Rumpelstiltskin--as we know it--ends. Gr 5-8-What would have happened if the queen had failed to guess Rumpelstiltskin's name and the odd little man had taken her child? Why did he want the young prince? Was his motivation selfish, or could he have been protecting the child from life-threatening danger? Imaginative answers to these questions skillfully blossom into a fantasy-flavored quest that begins when young Tousle leaves the secluded forest cottage he shares with his diminutive, magical, adoptive father Da, a spinner, and travels for the very first time to the city to view the king'sprocession. In Wolverham,Tousle becomes separated from Da and is surprised to find himself joining the queen in a plea for mercy for rebels facing execution. The king, acting against the wishes of his Twelve Great Lords, sets Tousle a riddle-"What fills a hand fuller than a skein of gold? "-and promises that the right answer will save the rebels' lives. Accompanied by a blind boy, Innes, Tousle seeks the riddle's solution on an adventure-filled journey to the Saint Eynsham Abbey, where the boys feel certain that the queen, who spends most of her time there in exile, will aid them. The youngsters find the solution to more than just the riddle as they learn the truth about the mysteries surrounding their own births, Rumpelstiltskin's identity, and the reason the child was taken from his parents. A good book to recommend to fans of Lloyd Alexander, Diana Wynne Jones, and J. R. R. Tolkien.-Ginny Gustin, Sonoma County Library System, Santa Rosa, CA Copyright 2001 Cahners Business Information.